With the Woodlore Winter Expedition courses fast approaching in early 2012, we asked Woodlore Head of Operations Dan Hume to write us an article of his memories from the Woodlore Nordic Skiing course. I have very fond memories of my time spent in Norway in February 2008. Perhaps it’s a course that almost lurks in the shadows and goes unnoticed but it really was so much more than I expected and truly was one of the best weeks I’ve spent outdoors. Brian Desmond who led the course, is a very experienced person in his field and he introduced the group to the basics of skiing over several days, pushing some members of the group onto more difficult terrain when appropriate. We had time to practise our newly learned skills whilst being amongst breathtaking scenery. After completing the first few days, I felt confident in setting up and maintaining my skis and negotiating some surprisingly tricky terrain, I’d also become better at managing my layers, an important consideration in cold environments. At the end of the week, we drove up into the mountains and travelled with our equipment, on skis, staying each night in a mountain hut, amazing scenery and team atmosphere; great fun. It was a good feeling to know I had started the week as a beginner and by the end had travelled confidently and safely for many miles with my gear. A great introduction not only to Nordic skiing but to the north in general. If you are wondering weather to join us this winter, I assure you, you will not be disappointed. If you have any questions regarding this course please do not hesitate to contact us in the office and speak to Dan. 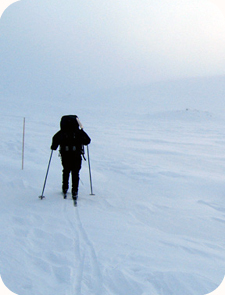 If you would like to join Woodlore and experience a fantastic introduction to the north on the Nordic Skiing Expedition or any other winter expedition in early 2012, please book soon as there are only a few spaces remaining. This entry was posted in Bushcraft Courses & Expeditions, The Woodlore Team on November 3, 2011 by Woodlore Team. Sounds like a fantastic experience, Cheers for the write up, Dan & Woodlore!